Every morning, I start the day with a big glass of chilled lemon water and set myself up with a pour-over cup of organic, fair trade, ethically sourced coffee. Mmm. It’s the perfect start to the day. It tastes great, gives me a boost, and helps me get my day started. But that’s not all it’s good for. 1. Drinking coffee makes your brain healthier. Studies have found that just 3 cups of coffee a day can decrease the risk of developing Alzheimer’s disease and dementia by as much as 65% in middle aged men and women. Additional research found it lowered the risk of developing Parkinson’s by 30-60%. 2. You fire up your metabolism. Trying to drop a few pounds? Good for you! Start your day with some coffee. Caffeine in coffee has been found to rev up your metabolism and help you burn those extra calories. This one’s a no-brainer for people who already love coffee, but now we’ve got some of that magical scienceto back it up! A study performed at the Harvard Public School of Health found that adults who drank two to four cups of caffeinated coffee had a 50% lowered risk of suicide compared to those who did not. 4. You reduce your risk of developing type 2 Diabetes. Another study performed at the Harvard Public School of Health found that drinking one cup of coffee a day lowered your risk of developing type 2 Diabetes by about 11%. 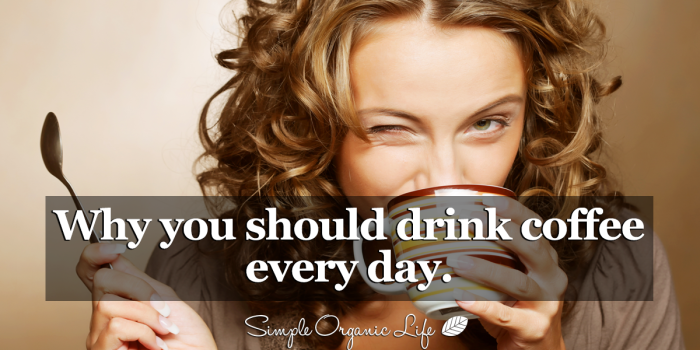 Those who drank two a day reduced their risk by 17%. 5. Coffee reduces the risk of skin cancer. Interestingly enough, yes, a study published in the Journal of the National Cancer Institute found that older adults who drank four or more cups of coffee a day had a 20% lower risk of developing malignant melanoma, the most dangerous form of skin cancer.